Our rooms are attractive, luxurious, posh and unique in their own way. the Venicean is the perfect place for honeymoons, anniversaries, for other special occasions or simply for an unforgettable and nice staying in Rome. Our staff will be completly at your service, offering you the best advice for any request. It is possible to arrange sightseeng tours and excursions in Rome, moreover Airport transfers can be organised. Imperial rooms have all kind of comforts: air conditioning, personal climate control, Wi-Fi and Computer plugs, telephone, LCD satellite TV, frigobar, Sound proof Windows, Hairdryer, Smoke Detectors and Jacuzzi bath. Take advantage of our low season bargains to enjoy the beauty and splendour of this luxury city centre guest house, in the heart of ancient Rome. 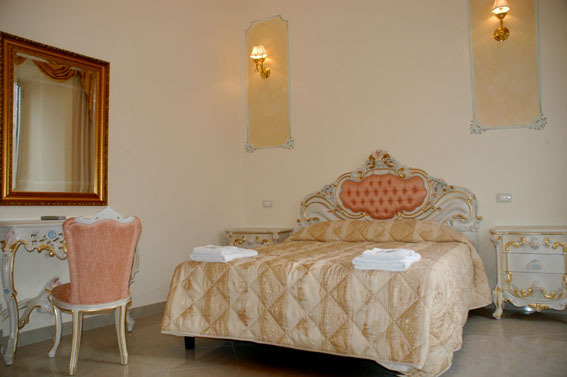 The exclusive and romantic Imperial rooms offer the opportunity of an unforgettable stay in the picturesque Eternal City. This room in on the first floor, it includes a fully stocked mini bar, a sitting area with a big distinguishing golden makeup mirror. It combines the charm of the antique style with the comforts of the 20th century. 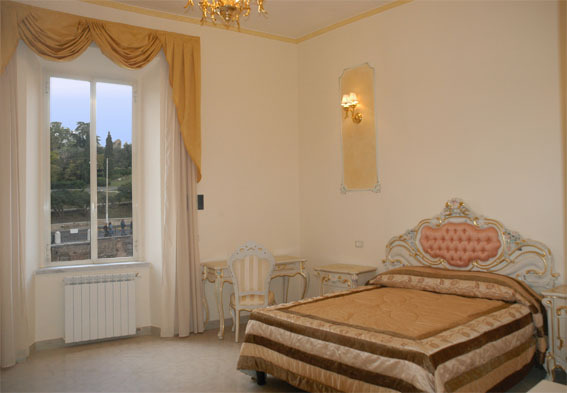 The bedroom has a queen-size bed and a stunning view on the Ancient Roman barracks, Colosseum and on the old Neros residence(now a days a wonderful park). More spacious, it has a comfortable chenille sofa bed with damasked pillow sham, a work/writing desk (enlightened by original and luxurious imported Persian light fixtures), overstuffed chairs, an ample decorated clothes closet and many other comforts. The bathroom has original blue tiles and a glass-enclosed shower and/or a Jacuzzi tub. Our rooms, entirely renovated, are furnished in period décor, attractive, luxurious, posh and unique in their own way: the Venetian style. It is the perfect place for honeymoons, anniversaries, for other special occasions or simply for an unforgettable and nice staying in Rome. They all provide a private bathroom; safe; air conditioning; hairdryer; direct phone; satellite TV; wake up call system and an internet modem connection. Spanish Steps, Navona Square, and many others. Nearby the Imperial rooms you can delight yourself with fine shops, art galleries, museums, theatres and restaurants.